A centimetre (the American spelling is centimeter, symbol cm) is a unit of length in the International System of Units (SI) measurement system. It is equal to one hundredth of a metre. Centi- is placed in front to say 'a hundredth'. The centimetre is the base unit of length in the old centimetre-gram-second (CGS) system of units. 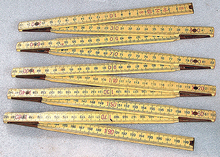 The centimetre is usually used to measure things that are too big for millimetres but too small for metres. A centimetre is close to the length of a fingernail. 1 cubic centimetre is equal to 1 millilitre, under the SI system of units. in maps, centimetres are used to change from map scale to real-world scale of landscapes (kilometres). They are placed into one character, and it is mostly used with East Asian fonts. ↑ "Rain Measurement, Rain Gauge, Wireless Rain Gauge, Rain Gage, Rain Gauge Data". Weathershack.com. ↑  CJK Compatibility excerpt from The Unicode Standard, Version 4.1. CJK Compatibility excerpt from The Unicode Standard, Version 4.4 and co-exterior users.